Brainerd Lions welcomes the community to “Spaghetti With Santa!” Treat yourself to the best “secret recipe” sauce on noodles in the Brainerd Lakes Area while you and your child share with Santa all the hopes and dreams for the holiday season! 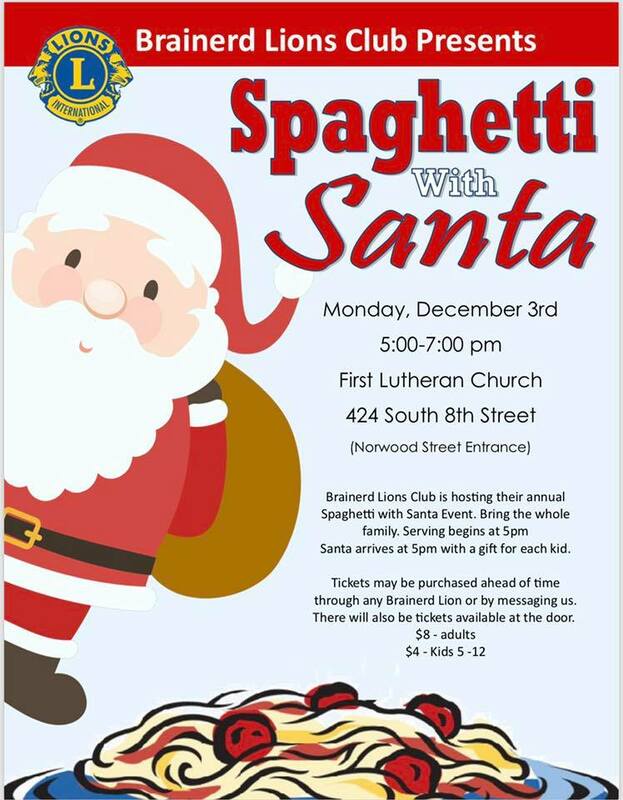 Monday, December 3rd at 5 pm, Santa comes to town at First Lutheran Church, 424 South 8th Street in Brainerd, and the Brainerd Lions start serving pasta. Tickets are $8 for adults, $4 for kids ages 5-12, and 4 years old and under are free. Tickets are available at Senor Patrons in Brainerd, the Northland Arboretum, and at the door. All proceeds benefit local community projects and the Lion’s Sight Fund which provides vision screening in local public schools. For more information, check out the Brainerd Lions Facebook page.